As part of our commitment to bringing the best products possible to our skincare customers, we now carry the Colorescience makeup line. These natural mineral makeups look great and are designed to protect your skin while keeping you looking your best out in the summer sun. Perfect for any outdoor summer adventure! 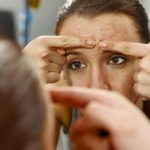 What makes this line of makeup so effective at defending your skin? It’s the fact that many of these selections come with a powerful SPF rating, up to 30 SPF for the UV protective foundation, and 50 SPF for the mineral sunscreen brushes. Look great and care for your skin by substituting your greasy sunscreen with a new daily makeup. All of these products are naturally formulated to be gentle and non-irritable to the skin. The powders are fine enough that your skin should breathe easily even with a complete application. The wide range of colors available for all different skin tones will make it easy to choose the perfect one for you. 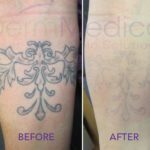 Check out the informational Colorescience videos below and give us a call if you would like to try them out on our skin. 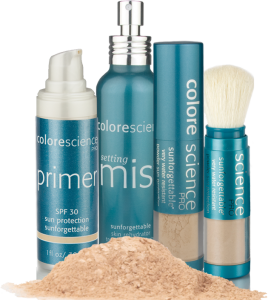 Colorescience uses minerals for UV photo-protection so parabens are not included in the formulation. Colorescience products go on the skin easily and look more natural than other products we have tested. Our patients love this product line, that’s why we keep selling it. Absolutely, it uses minerals to block UV rays which are not absorbed into the skin. Not much. You will get 1-2% more UVB photoprotection going with an SPF 50 over 30. Is Colorescience Safe for All Skin Types? What Is So Unique About Colorescience? Colorescience is a mineral makeup with integrated spf protection for great sun protection all day long. What Are The Benefits Of Using Colorescience Will I See After My Treatment? Colorescience is mineral based so there will be less potential irritation to the skin combined with excellent UV protection. 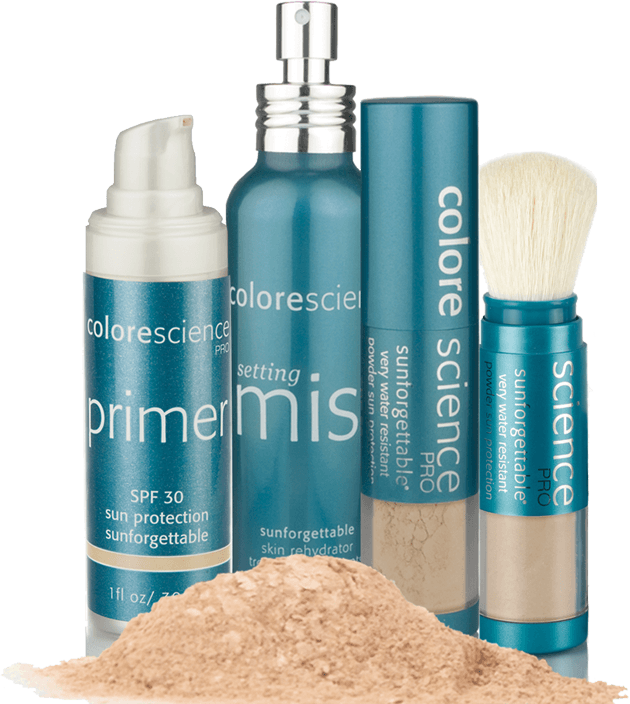 Can I Use Colorescience Mineral Makeup After A Major Skin Treatment? It depends on the treatment, but normally yes you can use these products either immediately or shortly after your laser/skin treatment. It is generally accepted that mineral makeup is better for your skin as the minerals used are inert and are less well absorbed into the skin itself making for less potential skin reactions. Is Colorescience Mineral Makeup Suitable For Mature Skin? Absolutely, all skin types can be suitable for mineral makeup like Colorescience. Colorescience makeup can definitely camouflage these conditions, however laser treatment can also make a long lasting or permanent change that helps the makeup work better.